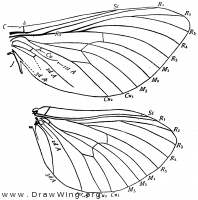 Wings of Pielus labyrinthicus (proper name is probably Abantiades labyrinthicus). From Comstock (fig. 416) . Fore wing of Hepialus. From Comstock (fig. 72) .